Dylan: No one fancied you at school. or in fact now. Ben: Not true. I do. So that’s one person. 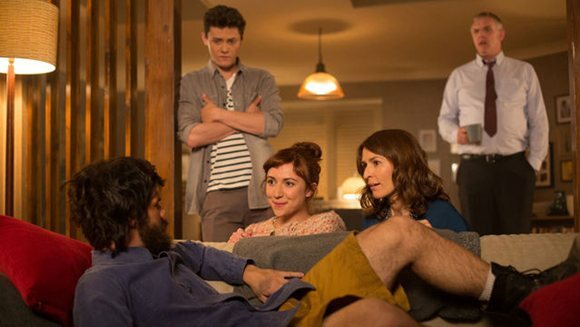 Helen Baxendale, Esther Smith, Tyger Drew-Honey and Matt Lacey in the British sitcom Cuckoo. This entry was posted in Line(s) of the Day and tagged ben, cuckoo, dylan, esther smith, helen baxendale, lorna, love, Matt Lacey, Tv comedy, Tyger Drew-Honey by alexraphael. Bookmark the permalink. I must say though I far preferred the first series, the guy from Twilight was likable enough but he didn’t have that ‘smug’ attitude that Cuckoo had!!!! I never even finished watching the second series and I was really excited about it coming back on TV. NOTHING against the kid from Twilight, I actually thought he was pretty good but like you say the dad is a very funny character and the main ‘humour’ in the first series was how much Cuckoo would wind him up and thwart him! Like the dead cat episode OMG that is hilarious!!!! Did you ever see Uncle on BBC3? That was brilliant too. I’ve not see Brooklyn 99 but I’m aware of it and looks good! I like Andy Samburg. I got into Brooklyn 99 straight away which sort of replaced Cuckoo for me. The fact the dad was always on his own was hilarious. Never heard anything about Uncle. How did you hear of it?